3.1 "Living Wage, Jobs for all Act"
Jim McDermott is a far left Democratic member of the United States House of Representatives, representing the 7th district of the state of Washington. He is currently serving in his twelfth term in the U.S. House of Representatives representing the 7th Congressional District of Washington State, which includes Seattle and parts of several neighboring communities. As a senior member of the Ways and Means Committee, Representative McDermott is the ranking member of its Trade Subcommittee and also serves on its Human Resources Subcommittee and its Oversight Subcommittee. Jim McDermott is married to Therese Hansen, an attorney in Seattle. He is the brother of Mark McDermott. Jim McDermott was born in Chicago, Illinois on December 28, 1936. He was the first member of his family to attend college, and went on to finish medical school. After completing his medical residency and military service in the Navy, he made his first run for public office in 1970 and was elected to the State Legislature from the 43rd Legislative District of Washington State. In 1974, Jim successfully ran for the State Senate, and subsequently was re-elected three times. In 1987, after 15 years of legislative service, McDermott decided to leave politics and to continue in public service as a Foreign Service medical officer based in Zaire (now the Democratic Republic of Congo), providing psychiatric services to Foreign Service, Agency for International Development, and Peace Corps personnel in sub-Saharan Africa. When the 7th District Congressional seat became open, he returned from Africa to seek election to the U.S. House of Representatives. He was elected in 1988 to the 101st Congress and is currently serving in his 12th term. 350 health care activists attended a conference at Seattle University Jun 22 1996, organized by the Washington Single Payer Action Network. Craig Salins, the organization's president hoped the conference could become a launching pad for a "greatly broadened crusade to win affordable, quality health care for all Washingtonians." In July 1996, the Democratic Socialists of America Political Action Committee endorsed James A. McDermott, Washington 7 in that year's Congressional elections. H.R. 950, the Job Creation and Infrastructure Restoration Act of 1997 was introduced in the 105th Congress on March 5, 1997 by Congressman Matthew Martinez of California. It had 33 original co-sponsors, including Jim McDermott. The primary purpose of this emergency federal jobs legislation was to provide much needed jobs at union wages to crisis ridden cities by putting the unemployed to work rebuilding our nation's infrastructure (schools, housing, hospitals, libraries, public transportation, highways, parks, environmental improvements, etc. $250 billion is authorized for emergency public works jobs over a five year period. Speakers from around the globe gathered at the Omni Shoreham Hotel in Washington, DC Aug. 7-9 1998, to discuss Muslim issues at the 2nd International Islamic Unity Conference. Under the auspices of the Islamic Supreme Council of America and its founder, Shaykh Muhammad Hisham Kabbani, religious and political leaders alike gathered to address concerns facing the Islamic community and to "condemn the oppression of Muslims worldwide". In the opening session, Congressman Jim McDermott (D-WA) addressed the lack of understanding of Islam in the United States. As he criticized the “unfair, ignorant image [of Muslims] presented in the media,” McDermott urged audience members to contact their governmental representatives to express their concerns. He emphasized that the United States is neither a Christian nor Jewish nor Muslim nation, but rather a nation where people of all faiths can live together in religious freedom. After an international campaign by pro-Colombia rebel activists, on February 9 1996, Senators Russ Feingold, Paul Simon and Tom Harkin, and on February 12 Representatives Jim McDermott, Tom Lantos and Porter plus 31 co-signers wrote Secretary of State Warren Christopher, urging him to have the U.S. representative to the UN Human Rights Commission (meeting in Geneva in March) support the issuance of a Special Rapporteur for Human Rights for Colombia. Signatories included Rep. Jim McDermott. 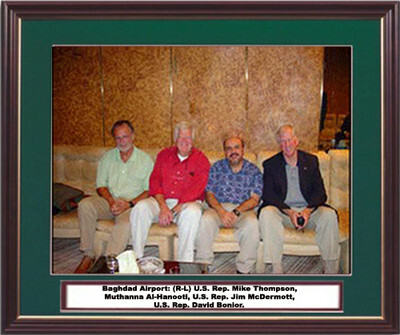 In 2002 David Bonior and two other Democratic Congressmen Jim McDermott and Mike Thompson traveled to Iraq on a fact-finding mission. It was later revealed that Iraqi intelligence had funded the trip through a Michigan based Muslim group headed by Muthanna Al-Hanooti. Photograph taken from Spring 2003 FAAIR Newsletter. Before he was indicted for allegedly spying for Saddam Hussein, Muthanna Al-Hanooti's charity work and political activism provided him with access to the highest echelons of government. Iraqi intelligence agents had reportedly had confidence that Al-Hanooti would be able to persuade Congress to lift economic sanctions against Iraq. A federal indictment unsealed in mach 2008 accuses him of using his work with the Michigan-based Life for Relief and Development (LIFE), formerly known as the International Relief Association, Inc., to become an Iraqi agent. According to the indictment, Al-Hanooti drafted a plan to undermine the sanctions for the Iraqis, listing members of Congress who would support the move. He then led tours to Iraq, indirectly funded by the Iraqi government, with congressional leaders including Democrats David Bonior of Michigan, Jim McDermott of Washington and Mike Thompson of California. LIFE issued a statement in advance of a 2002 trip, saying it was designed to help the representatives "gain a better understanding of the humanitarian plight faced by innocent Iraqi civilians still suffering from the destruction caused by the 1991 Gulf War and the continuation of the 12-year embargo." Photos of the junket in question were included in a 2003 newsletter published by an organization called Focus on American & Arab Interests & Relations (FAAIR), of which Al-Hanooti was President. According to the indictment, an intermediary for the Iraqis gave Al-Hanooti $24,000 in September 2002 to cover trip expenses, the indictment alleges. The next month, Al-Hanooti received $10,000 more. The indictment also claims he also was given the right to buy 2 million barrels of oil under Iraq's Oil for Food program. FBI agents interviewed Al-Hanooti in 2007. He denied knowingly meeting with any Iraqi intelligence officials and denied being offered the oil contract. That led to three counts in the indictment of providing false statements to federal agents. Rep. Jim McDermott called for putting “a million people in the street” to stop a U.S. attack on Iraq. “We’re here because we’re engaged in a national debate about life and death,” McDermott (D-Wash.) told the crowd who came to the Jefferson Park Community Center in Seattle Oct. 6, 2002 to hear his report on his recent visit to Iraq. McDermott was presented with two honors at the start of the meeting: a six-foot mockup giraffe, to symbolize his “sticking his neck out” for peace, from a group of women against violence, and a certificate from the parish of St. Patrick’s Church, signed by everyone in the parish, thanking him for his efforts. “If we don’t derail this coup that’s going on, we’ll be in a government that’s run by the President of the U.S. and the rest of us will be just standing around wondering what’s happening,” he declared. Though the U.S. is now the most powerful country in the world, he commented, history is full of the histories of powerful countries that fell because they reached beyond what the people would put up with. In his visit to Iraq, McDermott, accompanied by Reps. David Bonior (D-Mich.) and Mike Thompson (D-Calif.), spoke to 15 members of Iraq’s Parliament and told each, “If you don’t allow unfettered inspections, you will get a war.” Now that Iraq has agreed to inspections, Bush has been trying to “submarine” the process, McDermott told the Seattle meeting. McDermott, Bonior and Thompson wanted to see the effects of ten years of sanctions on the Iraqi people. “We have crushed them economically,” he said. McDermott said he saw many people ill with preventable illnesses, such as a 10-year old boy dying because he couldn’t get the medicine he needed. When he went to a pharmacy in Baghdad to see if he could get some prescriptions filled, McDermott was told “No,” they had none of the medications on his list. The Iraqi people are suffering elevated cancer rates and birth defects today from exposure to depleted uranium in ammunition used by the U.S. during the Gulf War, McDermott charged. “And we’re planning to send our soldiers to walk around in that poison dust?” he asked. “The fact is we have created a disaster and we have driven the people into the arms of Saddam,” McDermott said. When so many supplies have been withheld by our sanctions, he said, those items that get through are being distributed by Hussein, and Iraqi people who may have opposed him ten years ago are now grateful. “If we go into Iraq, there will be no uprising. They’re going to defend him,” McDermott said. Jim McDermott worked closely with Pramila Jayapal in launching Hate Free Zone (later OneAmerica) after the 9/11 attacks, "as they championed a people’s movement to defend our immigrant brothers and sisters who were under unjust racist, anti-Muslim, and immigrant-bashingattacks and threats". In 2002, Jim McDermott stood almost alone and dared to tell the world that George W. Bush was misleading the Americanpeople about the situation in Iraq. Hebecame “Baghdad Jim.” Months later, he and Pramila Jayapal would share the stage at one of the largest demonstrations in Seattle history, opposing the Iraq War. We were not able to stop that war, but brother Jim and Pramila Jayapal were our champions in that fight Pramila Jayapal is anotherwonderful example of a courageous leader. Jim McDermott and Pramila Jayapal worked together on a number of issues. When the mosque near Northgate was targeted by hate crimes and when Muslim women were attacked in Seattle for wearing the hijab, Pramila led the fight to protect them. When the immigrant grocers in the Rainier Valley were unjustly accused of being supporters of terrorism, brother Jim, Pramila Jayapal, and Hate Free Zone stood with them. Months later, the grocers were fully exonerated. Pramila also led the successful class action lawsuit against the Bush administration’s planned mass deportation of thousands of Somali men, preventing those deportations of thousands across the country. From June 30 to July 3 2007, Representative for the 7th District of Washington, Jim McDermott travelled with staffer Sean Hughes in Havana, Cuba on a "fact-finding trip. The cost of the trip, $3,603.60 was paid by the Center for Democracy in the Americas. The Second Agent Agent Orange Justice Tour, June 2007, held a meeting with U.S. Representatives Jim McDermott (WA) and John Conyers, Jr. (D - MI): 4:30 pm - Thursday, June 14, 2007 at the Judiciary Building Library, Washington DC. In 1998 James McDermott, Democrat was listed as a member of the Congressional Progressive Caucus. As of February 20 2009 Jim McDermott was listed as a member of the Congressional Progressive Caucus. Jim McDermott co-sponsored HR676 - medicare for all with John Conyers of Physicians for National Health & Labor. He also sponsored HR1200 - American health security act. Secretary of state has two major tasks: To define and represent U.S. interests in the world, and to bring the rest of the world’s interests to the United States. Rep. Jim McDermott (D-Wash.) — a 10-term member of Congress and a Progressive Caucus stalwart — would do both. McDermott has been a consistent voice for single-payer healthcare, for increased funding for the U.S. and global HIV/AIDS crisis, and for maintaining the estate tax. And he has stated unequivocally that Big Oil and the Iraq War are causing skyrocketing oil prices. Like any U.S. politician, his record isn’t perfect, particularly on trade. But unlike most of his colleagues, McDermott is independent and willing to think and act outside the Washington box. McDermott actively opposes U.S. threats of war against Iran, and he has challenged Israel directly, saying it’s “both appropriate and urgent for the U.S. to raise questions about [Israel’s] intentions” toward Iran. Secretary McDermott would not only call for redeploying combat troops out of Iraq, he would also press for bringing home all U.S. troops and mercenaries. He would enforce ignored laws prohibiting U.S. bases there. And he would immediately renounce U.S. efforts to control Iraq’s oil. In fact, he read into the Congressional Record the full text of the 1930 Anglo-Iraqi treaty, which set the same terms for British control of oil that the Bush administration is trying to impose on Iraq today. Secretary of State Jim McDermott would reclaim the primacy of diplomacy in U.S. foreign policy. 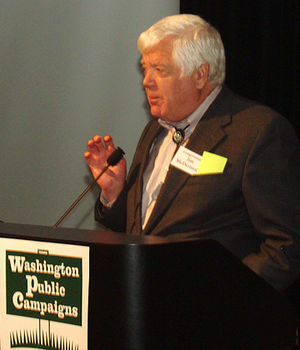 Congressman Jim McDermott was Guest speaker, at Craig Salins' Washington Public Campaigns, June 13, 2009. 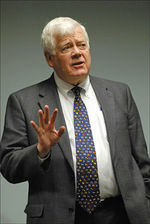 Congressman Jim McDermott connected the dots between campaign finance and health care reform. He felt this year featured a convergence of situations which made the passage of health care reform, with publicly funded health care funding, a practical possibility. Rep. McDermott explained that when hundreds of thousands of citizens got laid off in the past year, thuis losing their employer's insurance, they came to understand that health care is a crisis not only for poor folks, but for average middle-class families. One of nine statewide health care rallies took place in Seattle on Dec. 12 2009 for health care reform. It was sponsored by President Barack Obama's grassroots group, Organizing for America, and several statewide health care organizations. Rep. Jim McDermott, a strong single-payer supporter, said a "Medicare for All"-type system would be the most humane way to deal with the crisis. The problem is, he said, it's not possible to win at this time. But the bottom line is a public option, he said. McDermott likened the fight for health care, like building a house. "Obama is creating a house of health. We're going to get a bill." But much of all the legislative back and forth in both the House and the Senate, he said, are like the details that go inside the house, like cabinets. "The frame goes up first," he said. McDermott predicted the final bill will pass Congress by February. The desire to get health care reform passed was echoed by other rally speakers. Cassie Cummings of the Washington State Labor Council said the movement can compromise, but "we haven't stopped fighting." Seattle's Mayor-elect Mike McGinn, former regional chair of Sierra Club and is described as not your usual politician, said the crisis has taken too long to address. "But now it's within reach." On Dec. 22, 2009, thirty-three U.S. Representatives wrote to Secretary of State Hillary Clinton, calling on her to request that the Israeli Government end the ban on student travel from Gaza to the West Bank. Jim McDermott was one of the signatories of the letter. The entire letter together with a complete list of signatories can be read by clicking here. On Jan. 27, 2010, U.S. Representatives Keith Ellison and Jim McDermott led 52 other members of Congress in signing a letter addressed to President Barack Obama, calling for him to use diplomatic pressure to resolve the blockade affecting Gaza. The entire letter together with a complete list of signatories can be read by clicking here. In 1993, Communist Party USA supporter Pat Stell, one of the few union carpenters who also has done graduate work at Stanford, was chosen the Northwest "eyes and ears" for the U.S. Secretary of Labor. An aide to Rep. Jim McDermott for the past four years, Stell will be Region 10 representative for the Labor Department beginning Monday. Stell officially will be called the secretary's representative rather than regional director. Before working for McDermott, Stell, who had completed union apprenticeship training as a carpenter, ran a small business designing and building custom wood furniture. She also was a field representative for the U.S. Commission on Civil Rights and a community-relations specialist with the Justice Department. She speaks Spanish, has bachelor's and master's degrees from Stanford, and has been a member of the Higher Education Personnel Board and Coalition of Labor Union Women. She has been active in the Democratic Party. Seattle Communist Party USA member Irene Hull was honored for her 66 years of Activism by Congressman, Jim McDermott, at his 2010 annual Potato Fest. A few years earlier Hull solicited signatures at her residence, Council House for a petition about American policy on Iraq. Initiated by Congressman James McDermott, the petition called for open debate on the proposed war on Iraq. More than fifty of the approximately 150 Council House residents signed that petition. McDermott's mother was living at Council House at the time. At his 90th birthday party, April 24 2010, Communist Party USA member Will Parry picked up his guitar and led 400 union brothers and sisters, family, comrades, and friends in singing "Carry It On" ending, "No more tears, for we're still singing." Sponsored by the Puget Sound Alliance of Retired Americans, the celebration resounded with songs, poetry, and heartfelt tributes. Parry together with his late wife, Louise, helped build the labor movement and the senior citizen movement in the Pacific Northwest. A Phi Beta Kappa graduate of the University of Washington, he worked as a factory worker at Longview Fiber, a box factory organized by the Association of Western Pulp and Paper Workers. Robby Stern, PSARA president, told the banquet crowd, "Will has had an inspiring presence in the lives of everyone who is here. I have had the responsibility of stepping into the incredible shoes of the incredible Will Parry." Rep. Jim McDermott's aide David Loud read a letter from Rep. Jim McDermott, D-Wash., hailing Will Parry as a leader of the fight for comprehensive, universal health care reform. "We are indebted to you for your years of service," McDermott wrote. A 75th Birthday Celebration of Social Security featuring US Sen. Patty Murray, US Rep. Jim McDermott and others was held August 16, 2010, at the Phinney Neighborhood Association’s Greenwood Senior Center, 525 N. 85th St. in Seattle. There was birthday cake (donated by AFT Washington’s Retirees Chapter) and a sparkling apple cider toast (by the WSLC’s Jeff Johnson) as participants stress the importance of the Social Security system and the importance of stopping those who would use the deficit as an excuse to attack the program and cuts its benefits. The event was organized by the Puget Sound Alliance for Retired Americans and Social Security Works – Washington which includes the Coalition of Labor Union Women,Puget Sound Chapter APALA, Seattle Chapter, Physicians for a National Health Program, Western Washington chapter, Washington State Jobs with Justice. Speakers included Robby Stern, Puget Sound Alliance for Retired Americans, Will Parry Alliance for Retired Americans, Senator Patty Murray, Rep. Jim McDermott, Bette Reed, Marilyn Watkins, Teresa Mosqueda, Jeff Johnson, Washington State Labor Council. Nearly 200 people gathered at the Urban Horticulture Center on the University of Washington (UW) campus, Mar. 9, 2014, to honor George Starkovich, a lifelong Communist Party USA supporter for his lifelong work as a union organizer, an activist for jobs, peace, and equality. Starkovich died April 26 at age 91. Jim McDermott signed the letter. People lined up at microphones at a July 23 "speak out" here to demand that Congress stop kowtowing to the corporations and do what voters elected them to do: create good jobs at a living wage. More than 1,000 people, packed the Brockey Center on the campus of South Seattle Community College for the "Speak Out for Good Jobs Now, " one of a series of hearings across the nation sponsored by the 81-member Congressional Progressive Caucus. Listening to the often angry testimony was Rep. Jim McDermott, D-Wash., a leading member of the Progressive Caucus who told the crowd, "What is needed is citizen action....You have the power to organize," he said. Deborah Osborn, wearing a purple SEIU T-shirt told the hearing she has two college degrees and is a certified nursing assistant. Her husband, also a college graduate, has been unemployed for a year. Yet the longstanding "social contract" promises that a college degree is the path to "financial success." Jonathan Bernal Garcia, a senior at Chief Sealth High School decried the lack of good jobs for youth when they graduate from high school or college. "Please stand with us by enacting laws that are just, humane, and fair," said Garcia, a member of One America. Jazmin Santacruz, Eastern Washington organizer of One America, filled a bus with 53 immigrant workers from Yakima, Walla Walla, and Pasco, Washington to attend the speakout. "Stop passing anti-immigrant laws that punish immigrant workers," she declared. "All these workers want to do is support their families and in the process they bring money into the economy." She urged enactment of the Dream Act to allow undocumented immigrant youth to attend college in the U.S. She led the crowd in chanting "si se puede." Khayah Brookes, a senior physics student at the University of Washington, a member of the Academic Student Employees organized by the United Auto Workers said she was forced twice to drop out of school because she ran out of money. Michael Woo, a veteran Chinese American labor and community organizer, who chaired the meeting urged the crowd to take time to fill out the Progressive Caucus postcard addressed to lawmakers headlined, "Get Congress on Track...Rebuild the American Dream." "We have 1,000 people in this room and we want to get the message back to Washington, D.C." he said. "We want to tell Congress to rebuild the American dream. We need good jobs." Martin Luther King County Executive Dow Constantine thankedd the crowd for the testimony. "This is so powerful," he said. "It is hard to listen to the stories told today. We need to get the message to Congress that they were elected to create an economy that serves the people, not the corporations and the wealthy." Mia Franklin, a caregiver for her disabled daughter and an employee of ARC of King County, a non-profit that serves developmentally disabled people, drew cheers, telling the crowd, "I don't believe there is a budget crisis. They find the money for whatever the banks and corporations want but when it comes to the people's needs, they have no money. But it is our money. Use our money to create jobs. I love to fight. It's my second, unpaid job: fighting. I'm proud to have all you people here to fight with me!" On Saturday Jan 21st, 2012, a Coalition of Occupy Seattle, Peace and Justice activists, campaign finance reform advocates, Move to Amend (overturn Citizens United) and "Get Money Out of Politics" street performers assembled at Westlake Center to protest on the 2nd anniversary of the Supreme Court's Citizens United decision. Craig Salins introduced Rep. Jim McDermott to the audience. The March 3, 2012 7th Physicians for a National Health Program Western Washington Annual Public Meeting featured speakers Quentin Young, MD, National Coordinator for Physicians for a National Health Program, Amy Goodman, author and the host of Democracy Now!, Teresa Mosqueda, Legislative and Policy Director of the Washington State Labor Council and Chair of the Healthy Washington Coalition, and Representative Jim McDermott, Congressman for the WA 7th CD. As of December 2012, Jim McDermott was Honorary Chair of Physicians for a National Health Program Western Washington. Signatories included Rep. McDermott . In 2013 Progressive Democrats of America assigned activists to deliver their material to almost every US Congressman and several Senators. Peggy Abby, was assigned as contact for Rep. McDermott. July 16, 2014 Progressive Democrats of America Progressive Round Table. Signatories included Rep. Jim McDermott..
Rep. Jim McDermott has worked for Middle East peace and a two-state solution throughout his esteemed Congressional career. November 18 2014, McDermott delivered a speech on the House Floor, on President Obama's leadership in light of a potential nuclear deal with Iran, and the possibilities with an alliance with Iran to fight ISIS. A profound reduction in the decades-long tension between Iran, the U.S. and our allies that had set us on a path to war. A contained Iranian nuclear program with verifiable internationally-accepted limits. Meaningful sanctions relief that bolsters Iran's flagging economy and allows U.S. businesses access to a potentially vibrant market. An opening for a broader understanding between the U.S. and Iran, as well as an opportunity to court Iran as an ally in the fight against ISIS. It's fashionable around these halls and certainly in the media these days to deride the 44th president, to call him aloof when he acts methodically, to threaten impeachment when he acts decisively to promote the best interests of the American people. Many in this chamber have already raised their strong objections to a potential deal, and they've made no secret of what they think of President Obama and his "fools errand." "Credit belongs to the man who is actually in the arena, whose face is marred by dust and sweat and blood...who at the best knows in the end the triumph of high achievement, and who at the worst, if he fails, at least fails while daring greatly, so that his place shall never be with those cold and timid souls who neither know victory or defeat." The Alliance for Retired Americans endorsed Jim McDermott in 2012. The Alliance for Retired Americans Political Action Fund endorsed Jim McDermott in 2014. Rep. Jim McDermott (D-Wash.) (October 2016). No #IranDeal... yet. So, what's next? niacouncil.org/whatsnext — with Laicie Heeley, Reza Marashi, Stephen Miles, Lara Friedman, Keith Ellison and Congressman Jim McDermott. This page was last modified on 13 April 2019, at 03:56.